At a recent human rights colloquium held in Sao Paulo, activists and human rights defenders from around the world confirmed the growing importance of the street and the square in the struggle to realise basic rights. Recent examples included the victories won by Movimento Estudantil in Chile and the occupiers of Taksim Square in Turkey. Like the occupiers of Tahrir Square and Zucotti Park before them, people in these movements claimed public city spaces to make democratic demands that have resonated on a global scale. Indeed, as Alexandra Délano and Melissa Ortiz Massó illustrated in their recent piece on Mexico, citizen-led protests can have a profound effect on political accountability and democracy. However, the colloquium also substantiated the intensifying threat against the people occupying these spaces. Activists from Bahrain to Brazil have suffered increasingly violent state repression. And yet, the street is a site for public assembly where radical democratic achievements are being won, despite the serious risk of injury facing its occupiers. Global media coverage of rights struggles and the street overlooks other important relationships people have with the street. Unfortunately, global media coverage of rights struggles and the street overlooks other important relationships people have with the street. The overwhelming focus has been on occupations of public spaces that are characterised by demonstration or protest, where vulnerability means injurability. Those who take to the streets in these instances are exposed to increasingly violent police and private security forces, and are vulnerable to the threat these forces often pose to their bodily integrity. The colloquium considered, for instance, the disappearance of 43 Ayotzinapa College students after an encounter with police at a demonstration in Mexico. The coverage of these occupations, and the often brutal responses they engender, are crucial. However if we are to understand the relationship between the street and struggles for rights, we must also foreground other kinds of vulnerability experienced by people who make use of public spaces. One such example is exclusion from the streets, which can often produce socio-economic vulnerabilities. In Johannesburg, people who use the streets for work have been forced off of them in different “cleaning” operations carried out by local government over the last three years, including Operation Clean Sweep and the ongoing Operation Ke Molao. This exclusion stems from poor urban management and the privileging of private business concerns over the rights of street traders. Frequently, an aesthetic impulse informs the “cleaning” operations, in which informal livelihood strategies, like street trading, become analogous with “grime” that needs to be removed from the city streets. People who make a living on public streets, in Johannesburg and elsewhere, have a different relationship to the streets than those occupying public spaces in order to make democratic demands and hold power to account. Street vendors in Johannesburg, South Africa. One difference is that occupations of this kind have a temporal aspect to them that livelihoods made on the street do not. Occupations invariably end. Whether because they have been successful, or the goals change, or they lose momentum, or they are crushed. Even movements with extraordinary durability, such as Asociación Madres de Plaza de Mayo (also present at the Sao Paulo colloquium), are bound by this temporality. Those who make their living on the street, on the other hand, make every effort to establish their businesses—their occupation of the streets—with as much permanence as possible. 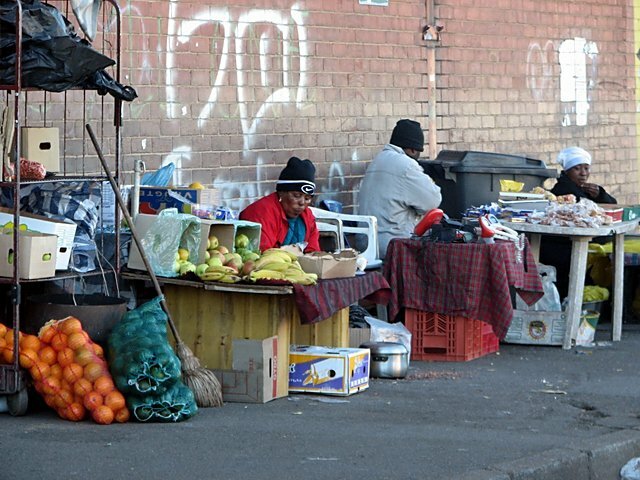 Stalls selling fruits and vegetables in Johannesburg’s inner city have often been in a family for generations. The ability to establish themselves on the street over long periods of time allows street traders to build loyal customer bases and access higher volumes of pedestrian traffic. Another crucial difference between making a living on the streets and using them to make democratic claims involves the police. Police are often deployed brutally against occupiers. Protestors are vulnerable to unforgiveable acts of violence while they are on the street. Often this violence is seized upon and appropriated by protestors for conscientising ends, fuelling energies of resistance. Street traders in Johannesburg are also vulnerable to acts of police brutality, and especially over the last three years. However their violent removal from the streets at the hands of police constitutes different forms of vulnerability. When police remove traders from the Johannesburg streets, they rob them of their livelihoods and the ability to support their families in a context of widespread unemployment in South Africa. When street traders are exposed to violent removal from the public spaces they occupy, it is not injurability that characterises their vulnerability. Rather, it is a vulnerability articulated as an exposure to the reality of an economy and urban development agenda that actively excludes poor people. It is clear that struggles happening on the streets, and the different responses to them by states around the world, have a great deal to say about the possibility of more democratic futures. However as important to this possibility is amplifying the struggle of people who face socio-economic exclusions from the street, which imposes direct threats to their ability to live decent lives.